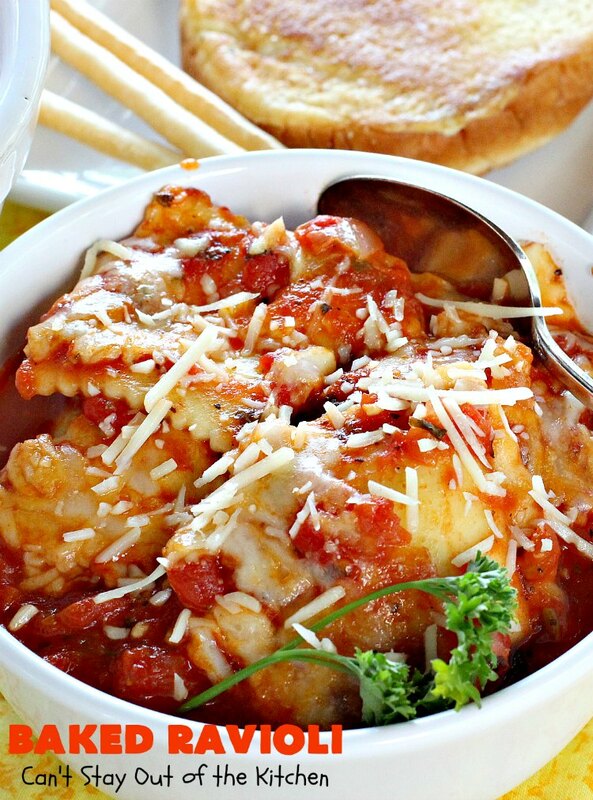 Baked Ravioli is awesome! It has the convenience of store bought ravioli pasta with the delicious taste of homemade marinara sauce. Then it’s covered with cheese to make it a very satisfying main dish meal. This recipe is perfect for a Meatless Monday dish if you use cheese, spinach or even butternut squash ravioli. 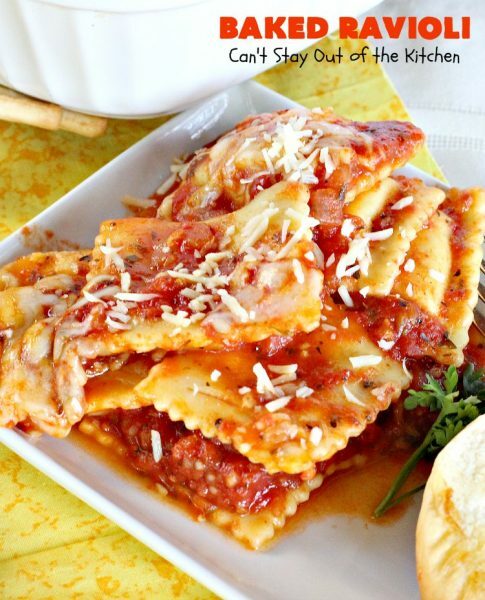 But if you prefer beef or sausage ravioli you can certainly use them as well. I was looking for a quick and easy recipe to make for friends the other day. I came across this one that I had saved last year when I first saw it on Pinterest. This Martha Stewart recipe was great in texture but weak in flavor. As I recall it used only thyme for seasoning the marinara sauce. That was way too bland for our tastebuds since we love strong Italian flavors in spaghetti sauce. Fortunately, with a good bit of tweaking, this entree was made incredibly delicious. Since the tomato sauce is more than ample for the amount of ravioli used (uh, like way too much), I also increased the ravioli to two 25-oz. packages. You can use cheese, spinach, beef, or sausage ravioli. All turn out wonderfully in this entree. For a burst in flavor, I added one and a half teaspoons each of basil, oregano, Italian seasoning, and fennel seed, two tablespoons of parsley, and three bay leaves. This really made a huge difference in taste. It made the homemade marinara sauce pop in flavor and reminded me of our incredible Baked Manicotti recipe that also uses a homemade marinara sauce. If you’re looking for a tasty, yet quick and easy main dish for your family, then consider trying this recipe sometime. Another great thing about Baked Ravioli is it’s quite economical and stretches to feed 8-10 servings. I highly recommend you purchase fennel seeds to use for making the sauce. While you can make the marinara sauce without it, it tastes SOOOO much better with the fennel seeds. This delicious dish is featured at All Free Casserole Recipes here. Check it out sometime! 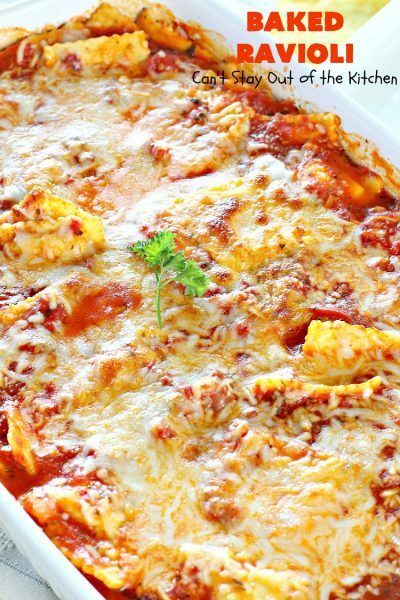 Baked Ravioli is a quick and easy main dish to prepare for your family. 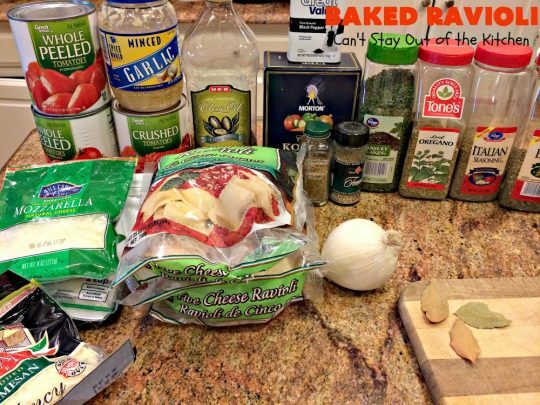 You can use any kind of ravioli you prefer: cheese, spinach, beef, sausage, pumpkin or butternut squash ravioli. Baked Ravioli uses the convenience of prepackaged ravioli with a homemade marinara sauce. Add more freshly grated Parmesan or Asiago cheese if desired. 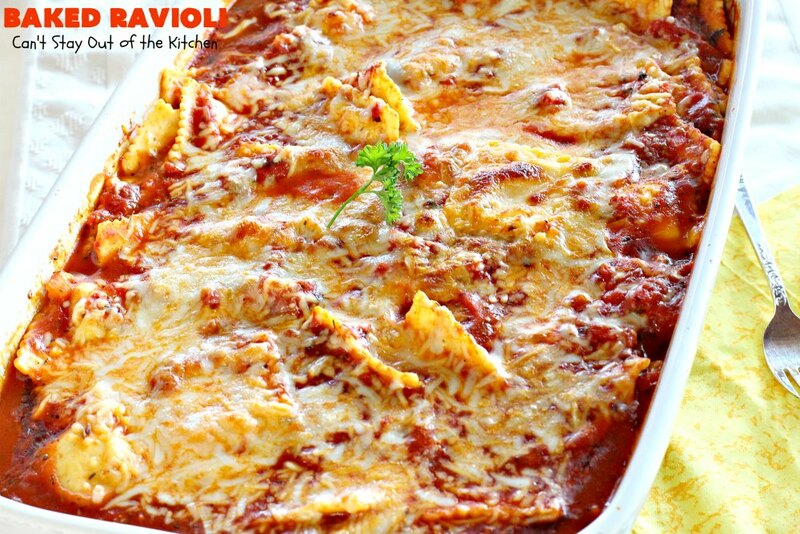 Baked Ravioli is a fabulous dish to use for Meatless Mondays if you choose cheese, spinach, pumpkin or butternut squash ravioli. Pour olive oil into a large stock pot. Add diced onion and saute. After a few minutes add a heaping tablespoon of minced garlic from a jar. Stir in kosher or sea salt and pepper. Stir to combine. 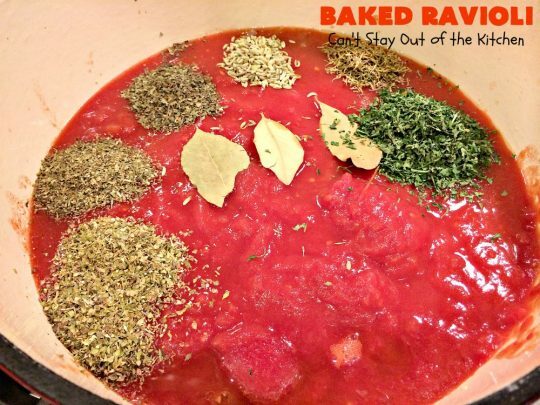 Add whole tomatoes, undrained, crushed tomatoes and thyme, basil, oregano, Italian seasoning, fennel seed, parsley, and bay leaves. Stir to combine. Simmer about 20-25 minutes. Remove bay leaves before combining with pasta. Mash tomatoes down with a potato mixer after a few minutes and continue cooking. Meanwhile, boil pasta for just a couple of minutes and drain. Mix drained ravioli with marinara sauce and combine. Cook ravioli according to package directions–about 3 minutes or until ravioli floats on top of the water. Drain and add to tomato sauce. 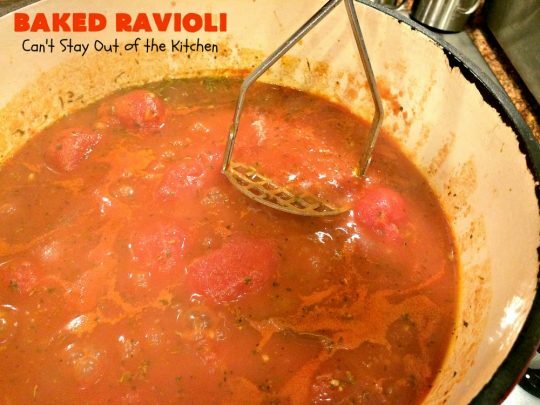 Pour ravioli and marinara sauce into a well-sprayed 9×13″ baking dish. Sprinkle with freshly grated Parmesan cheese (don’t use the stuff in the can). Sprinkle the top with mozzarella cheese. Here is Baked Ravioli fresh out of the oven. This is a superb entree for Lent or Meatless Mondays. Baked Ravioli is a good choice for company dinners, too. 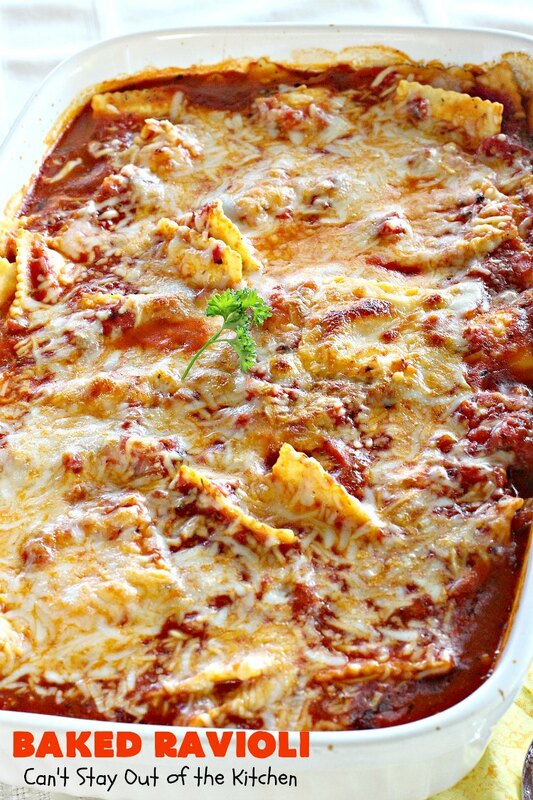 Baked Ravioli can be made in just a little over an hour making it fairly quick and easy to put together. Serve Baked Ravioli with extra grated cheese and some Easy French Bread. Tasty Martha Stewart inspiration that uses the convenience of packaged ravioli with a homemade marinara sauce. 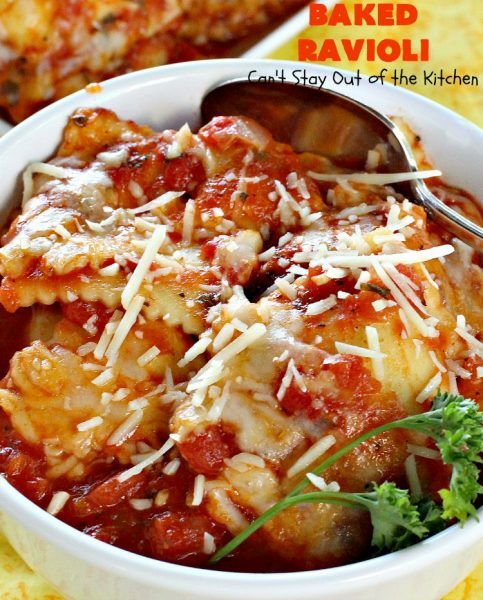 The ravioli is covered in parmesan and mozzarella cheeses for a burst in flavor and gooey texture. This entree is kid-friendly and terrific for Meatless Mondays. Add onion and garlic, and season with salt and pepper; cook, stirring occasionally, until softened, about 5 minutes. Add tomatoes, thyme, oregano, basil, fennel seeds, Italian seasoning, parsley and bay leaves. Bring to a boil, reduce heat, and simmer. Mash up tomatoes with a potato masher until sauce is thickened , about 20 to 25 minutes. (Remove bay leaves). Meanwhile, cook ravioli in a large pot of boiling salted water just until they float to the top (pasta will continue to cook in oven). (This will be about 3 minutes). Drain pasta; return to pot. Pour pasta into a 9-by-13-inch baking dish that has been sprayed with cooking spray. NOTE: While the additional seasonings of oregano, basil, Italian seasoning, fennel seed, parsley, and 2 bay leaves are not included in the original recipe, they are needed to increase the flavor of this dish. Otherwise, the recipe will be too bland. Remove bay leaves before serving. NOTE: While you can omit the fennel seeds if you don't have them, they highly increase the flavor of the marinara sauce. They are worth purchasing for future Italian dishes with marinara sauce. Recipe inspired from Martha Stewart. 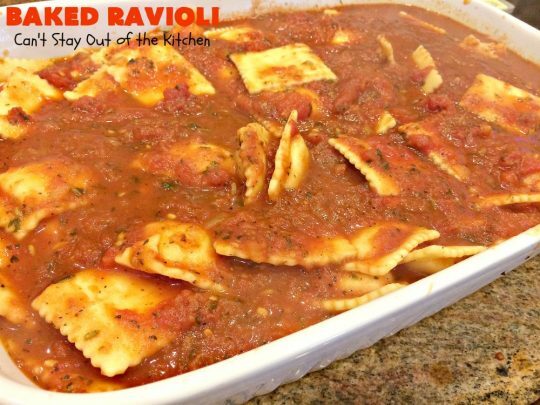 Tasty Martha Stewart recipe that uses the convenience of packaged ravioli with a homemade marinara sauce. Then the ravioli is covered in parmesan and mozzarella cheeses. Add thyme and tomatoes. (At this point I would add extra seasonings to enhance the flavor of the sauce). Mash up tomatoes with a potato masher until sauce is thickened , about 20 to 25 minutes. Meanwhile, cook ravioli in a large pot of boiling salted water just until they float to the top (pasta will continue to cook in oven). I highly recommend adding 1 teaspoon each of oregano, basil, Italian seasoning, and fennel seed, 1 tablespoon parsley, and 2 bay leaves to increase the flavor of this dish. Remove bay leaves before serving. 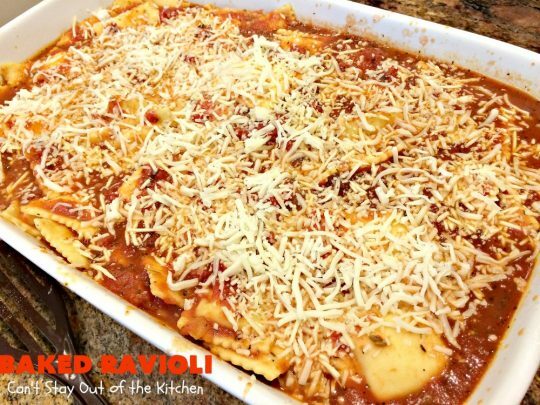 Baked Ravioli is a really great option for dinner when you only have about an hour to an hour and fifteen minutes to put something together. 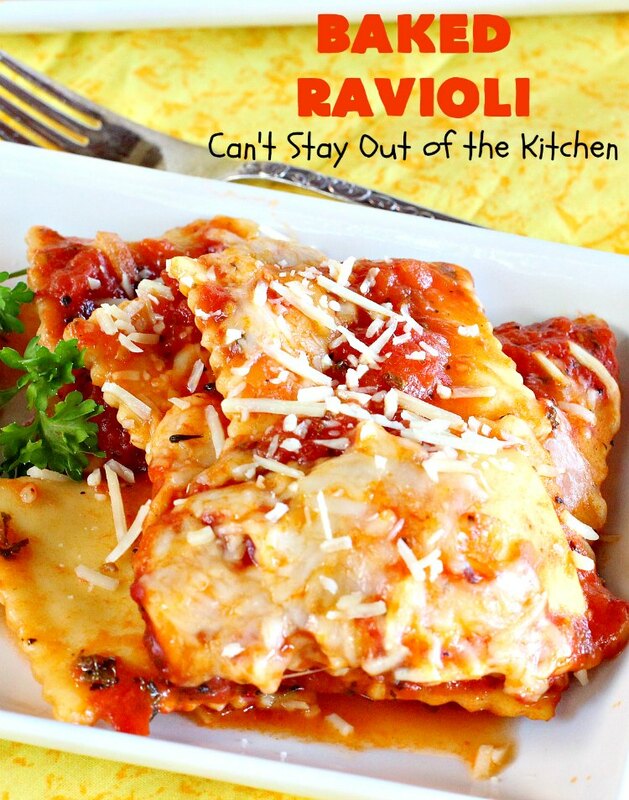 While making homemade ravioli is great, most of us don’t have the time to do that. 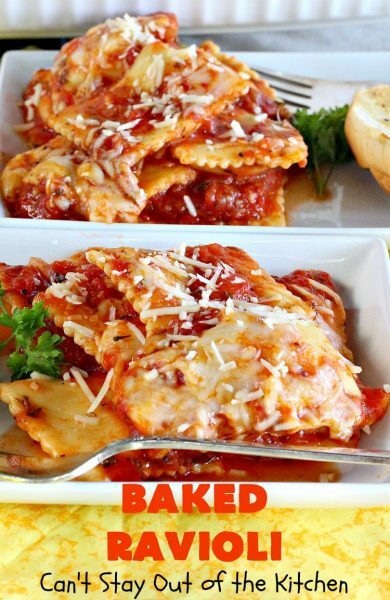 Baked Ravioli allows you to use prepackaged ravioli with a homemade marinara sauce. 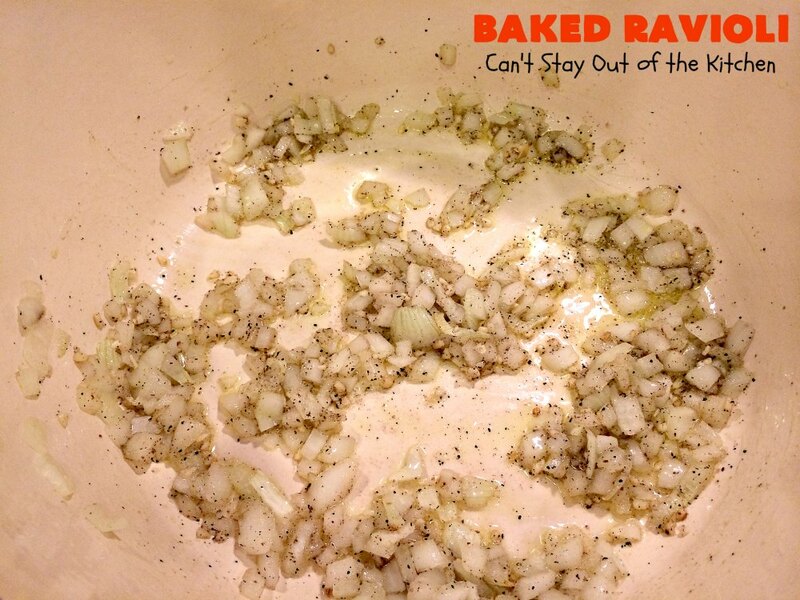 Baked Ravioli is kid friendly, too. This dish is quite easy to double in case you want to make another pan for a freezer meal or take a pan to new mothers or sick friends. This casserole also sets up really well along with being an economical main dish entree. Baked Ravioli with the increased seasonings is a wonderful meatless main dish, but you can use any kind of meat-filled ravioli if you prefer. I have one child that should have been Italian. She love anything with RED sauce. She also loves Ravioli. I will have to try this for her. I am going to pin this one too. It just sound fantastic! This is really quick and easy for homemade Italian marinara sauce, too. You can make it with cheese and do meatless, or use ravioli with meat. 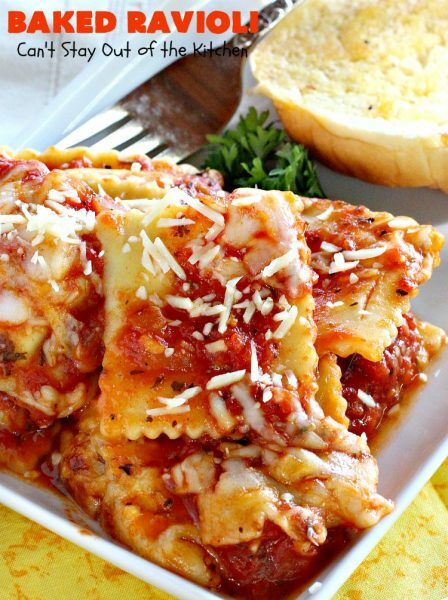 This ravioli looks so good–yum! I really love how you made your own sauce. I really don’t like store bought mariner sauce. 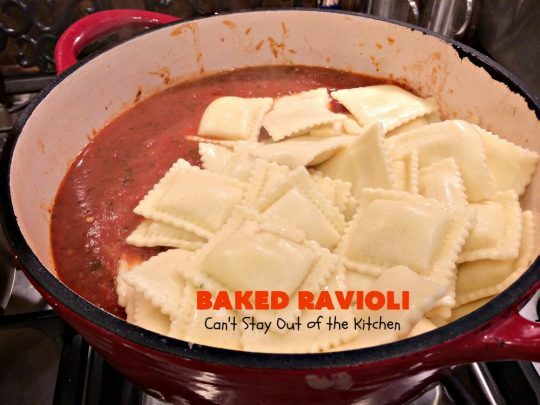 I actually have some cheese ravioli in the freezer so I could definitely try this. I think I would also go as far as adding lots of veggies.